It first started when I was diagnosed in February 2015, just 3 months before sitting my first-year exams in college (UK). I was put on medication and unfortunately, it took a good while for my brain to adjust to the changes; longer than the time I had. The changes going on in my brain made it hard for me to control my emotions (it had to get worse before it got better), and more importantly it made it harder for me to learn and retain information. It was no wonder that I ended up not doing too well in those exams, between my brain and body adjusting to a new medication, and my anxiety disorder worsening the more I was forgetting. So, I didn’t do very well that year, oh well. But I wasn’t going to leave it there and give up on working to get to university. So I re-enrolled to repeat that year of college to do my A-level Business studies again, do an Extended project qualification where I was to research and write about any subject I was passionate about, doing an AS in core maths where we were learning about the practical side of maths such as how to apply and pay mortgages and knowing how to pay taxes. I finally then took a Subsidiary diploma (where it is the equivalent of an A-level but it has no exams, purely coursework) in medical science. And that brings me onto my first tip when it comes to coping with mental health problems in academic life; be sure to find courses that work with you and your mind. I know I did better with coursework rather than exams as the build up to them cause me to have panic attacks. So even though a couple of the courses had exams, I chose two that were only coursework based meaning to help take some of the pressure off from having to try and retain information. Anyway, my repeat year came and went, and thanks to taking courses that worked better with my mind, my business studies grade went from a D to an A, and I did so well that I was able to finally make it onto the second year of college. This was the year that really counted as the graded I got in this year affected if I was going to make it into university. Be sure to have a plan of what you are going to do and when. I made up a timetable around my college timetable so I knew what I was going to study and when. Also, make sure to give yourself free time to do any hobbies and activities. And this is probably the most important one; TALK TO SOMEONE!! Be it a lecturer, a friend, a member of your family, your doctor. Don’t keep it all bottled up inside of you otherwise it’s all going to come to a head at one point or another, and then your mental health is really going to suffer. It’s also worth doing some research to find out if there is any help available to you. So, I was using my own tips through my last year of college, and I came out with some of the top grades, something with improved my anxiety and depression as it gave me a boost in my confidence. I ended up getting into University, and I am happy to say that I now study BSc Food Development and Innovation. And I continue to use these tips as I go through university, and I will probably use them throughout my life. 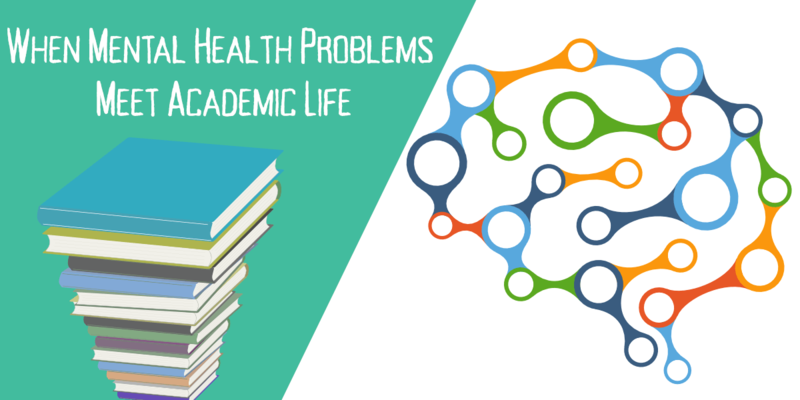 I hope that you find this post helpful when it comes to understanding the impact that mental health problems can have on your academic life. I hope these few tips will help you learn and understand on how to cope with these problems before they become too much to cope with. But for now, be happy, be healthy.